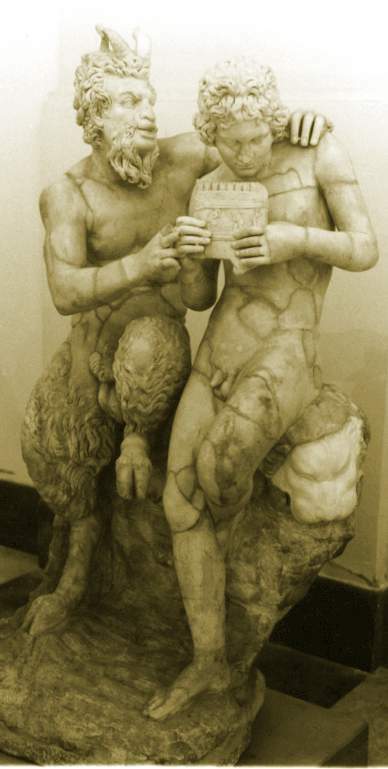 Also known as Aristaeus and Aigipan (goatherd), known in Roman mythology as Faunus or Sylvanus. Son of Hermês and Dryope (or Penelope). The Arkadian god of flocks and shepherds, of trees, forests and wildlife, of the hot noonday stillness, and of freedom and fertility. Playful, lascivious, unpredictable and lecherous, he is depicted as human, but with the ears, legs, hooves, tail, horns and beard of a goat. Some say he dwelt underground. He was fond of music, and is often shown bearing the syrinx, or pan-pipes (Syrinx was a wood nymph who fled Pan's lecherous advances by changing herself into a reed). The Orpheans associated Pan with Dionysus Zagreus. Herodotus places his birth (i.e., his appearance in Greece) at c. 1200 b.c.e., but some legends portray him as very ancient, even as the foster-brother of Zeus. In Greek, the word pan means “all,” and the Orpheans conceived of Pan as a symbol of the Universal, a personification of Nature; both Pangenetor, “all-begetter,” and Panphage, “all-devourer.” In this aspect he is portrayed in Tarot Trump XV.